The nucleus of a cell is usually a highly organized structure, with more than a metre of DNA packaged very carefully into a tiny volume. A number of degenerative diseases, including Alzheimer’s, SCA7 and progeria are associated with a breakdown in nuclear organization. 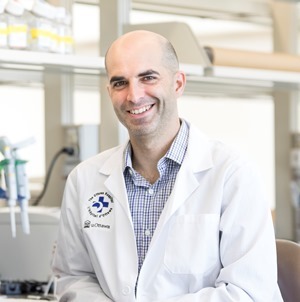 New research led by Dr. Pierre Mattar and Dr. and Dr. Michel Cayouette sheds light on nuclear organization using eye cells as a model. Specifically, the team looked at a protein called Casz1 in mouse rod cells, which are responsible for vision in low light. They found that rod cells without Casz1 had disorganized nuclei, and this led to problems with gene expression and cell survival. They also found that Casz1 controls nuclear organization by blocking the expression of a protein called lamin A. Future research could lead to a new understanding of nuclear organization and new targets for treating related diseases. See PNAS for details. “If we can understand how DNA is packaged inside our cells, we may be able to develop treatments for a wide variety of diseases where this goes awry,” said Dr. Pierre Mattar, Scientist and Clifford, Gladys and Lorna J. Wood Chair for Research in Vision at The Ottawa Hospital, Assistant Professor, University of Ottawa. Authors: Mattar P (The Ottawa Hospital, University of Ottawa), Stevanovic M (Montreal Clinical Research Institute, McGill University), Nad I (The Ottawa Hospital, University of Ottawa), Cayouette M (Montreal Clinical Research Institute, McGill University, Université de Montréal). Funders and acknowledgements: Research at The Ottawa Hospital is possible because of donations from the community. This study was also supported by the Foundation for Fighting Blindness, the Canadian Institutes of Health Research, Fonds de recherche du Québec-Santé, the Gladys and Lorna J. Wood Chair for Vision Research at The Ottawa Hospital and the Gaëtane and Roland Pillenière Chair in Retina Biology at the Montreal Clinical Research Institute.